If you sit in your back yard on a clear, dark, moonless night and stare into space for a while you will almost certainly see a shooting star. Meteors, to give them their scientific name, are caused by particles of interplanetary dust, no bigger usually than a grain of sand, hurtling into the atmosphere at, typically, 40 kilometers per second (89,500 mph) and vaporizing as the air tears them apart. At certain times of the year we can see showers of meteors – the Lyrids in April, the Perseids in August, the Leonids November – but most meteors are “sporadic” and are not associated with any of the major meteor showers. If the sky is really dark and you know where the Ecliptic lies, then you may notice a faint semi-oval shaped background glow. This is the Zodiacal Light. In exceptionally dark conditions you may see an even fainter extension to the light stretching across the sky – the Zodiacal Band – and if you know where the anti-solar point is (that part of the sky directly opposite the Sun) and you have very good eyesight, you may even spot a faint circular or oval “cloud” known as the Gegenschein or Counterglow. All these phenomena – sporadic meteors, the Zodiacal Light, Band and Gegenschein – are witness to the fact that the Solar System is bathed in a vast interplanetary dust cloud. But where has all this dust come from, how old is it and how does it behave? 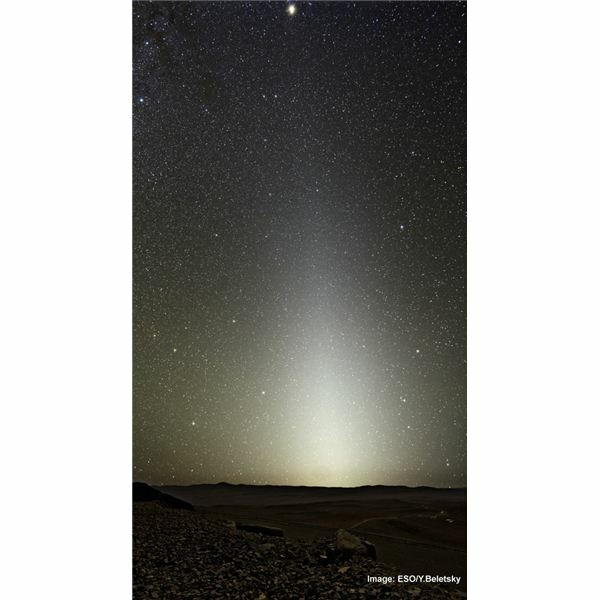 The Zodiacal Light, Band and Gegenschein are caused by sunlight reflecting off tiny interplanetary dust particles (IDPs), which, like the planets, lie in the plane of the Solar System. These sky glows are one and the same phenomenon: they only look different in shape and brightness because of the angle of the light reflected from the particles in the interplanetary dust cloud. 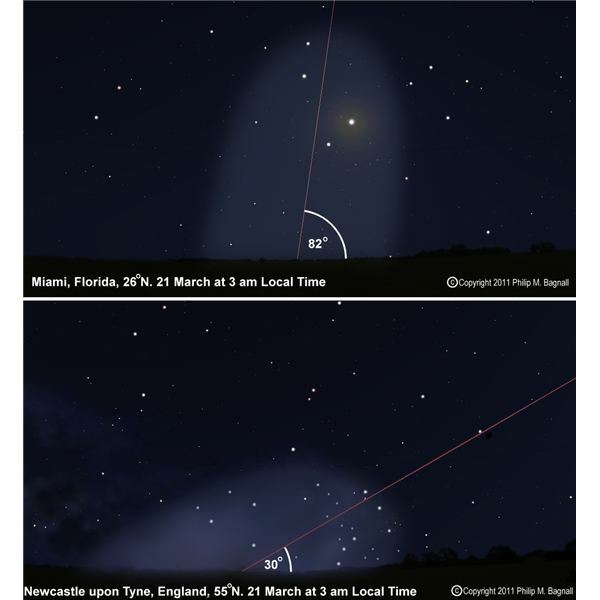 Your best chance to catch a glimpse of these phenomena is in spring and autumn when the Ecliptic makes a steep angle to the horizon (see image). Look towards the west after sunset and after twilight has completely subsided, or towards the east before dawn. The closer you live to the Tropics, the better your chances of seeing the glows. The IDPs themselves are as old as the Solar System, around 4.56 billion years, but they exist as discrete dust particles for probably less than 100 million years. This is because of the complex dynamics to which the IDPs are subject. Like everything else in the Solar System, IDPs orbit the Sun. Where they differ from other larger objects, however, is that they tend to spiral inwards, their orbits gradually decreasing in size as time progresses. What causes this is the way the IDPs react with light and other forms of solar radiation. The dust particles absorb light and then re-radiate some of it at a different wavelength. This causes a tangential drag on the dust particle: it loses orbital energy and so begins to spiral down towards the Sun, a phenomenon known as the Poynting-Robertson Effect. All objects in the Solar System process radiation in the same way. However, for larger bodies the tangential drag is negligible, so there is no fear of the Earth drifting towards the Sun. If this was the only process at work, then all IDPs would eventually get so close to the Sun that they would vaporize, and, indeed, many do. But a significant number escaped this fate. 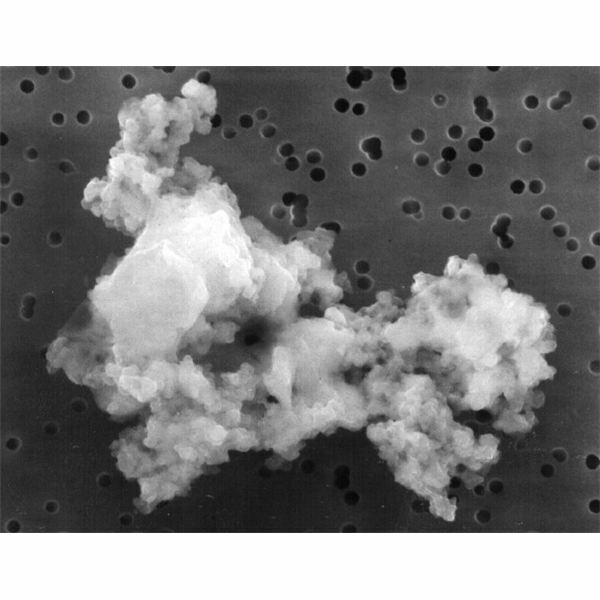 Space weathering involving inter-particle collisions, thermal shock and the evaporation of some minerals can reduce the mass of a particle to such an extent that the pressure of solar radiation overcomes the tangential drag and stops the particle in its tracks, lodging it into a near-circular orbit. Though not for long. An increase in radiation pressure and further space weathering may reduce the mass of the particle further and push it back out towards Jupiter. On its way the dust particle may encounter other IDPs and either break up further or stick to them. So the life cycle of a single IDP can be complex but, whatever the scenario, it is unlikely that an IDP could remain in the Solar System for more than about 100 million years. Apart from the possibilities noted above, some IDPs will fall into the planets, producing the sporadic meteors we have already mentioned, while others will be gravitationally kicked out of the Solar System by massive Jupiter. So if the Solar System is 4.56 billion years old, and IDPs last for only 100 million years, then how come they still exist? Clearly the IDP population must be replenished to replace those that are destroyed or ejected. It is now widely believed that about 80 to 85 per cent of IDPs are fragments of short period comets. Comets are often described as being like “dirty snowballs”. They consist of water ice peppered with dust and came into existence early in the history of the Solar System. Most of the proto-comets were banished to the very outer regions of the Solar System, around 50,000 AU (0.8 light years) from the Sun, and are still there in the Oort Cloud. Collisions between the deep frozen comets, and perhaps the passage of a wandering star, can disrupt their orbits sending some comets into the inner Solar System. Once they come under the gravitational influence of Jupiter their orbits are radically altered into periods of just a few decades. As they begin to approach the Sun the comet’s ices sublimate: that is, they turn directly to gas without going through a liquid phase. This can be a very effervescent and explosive reaction with the embedded dust particles being ejected from the comet to form a stream of “micrometeoroids”, as they are often called, around the Sun. If the Earth encounters such a stream we are treated to a meteor shower. But the Solar System is a big place and the Earth is a small target and misses most of the streams. Eventually the streams dissipate completely, because of the processes highlighted above, and thereby replenish the Zodiacal Cloud. Most of the remaining 15 to 20 per cent of IDPs are the result of collisions between the asteroids, while some may be interstellar particles. Just as Jupiter can eject IDPs from the Solar System, other planetary systems can do the same thing, sending a few our way. Our Solar System is not the only one to have a dust cloud. Dust clouds in various stages of evolution have been identified around a number of stars. Vega, the brightest star in the constellation of Lyra, has an extensive cloud spread out to more than 800 AU from the star. It has been proposed that the dust in the Vega system may be the result of a fairly recent destruction of a substantial asteroid of around 0.003 Earth masses. Capturing an IDP is no easy task. They are so small, so fragile and move so fast that the very act of collecting them can destroy their structure. High flying U2 aircraft have used sticky cells to pluck IDPs from the stratosphere while ground based experiments have filtered IDPs from rainwater. Experiments such as these can tell us about the composition and nature of comets and other minor bodies in the Solar System. But if you are really curious about what an IDP looks like then try this. Go into your kitchen, open a jar of Nescafé instant coffee and pluck out a single granule. What you now have in your hand is a pretty good model of what an IDP probably looks like in space.